A commonly held misconception is that the solar seasons are equal in length. 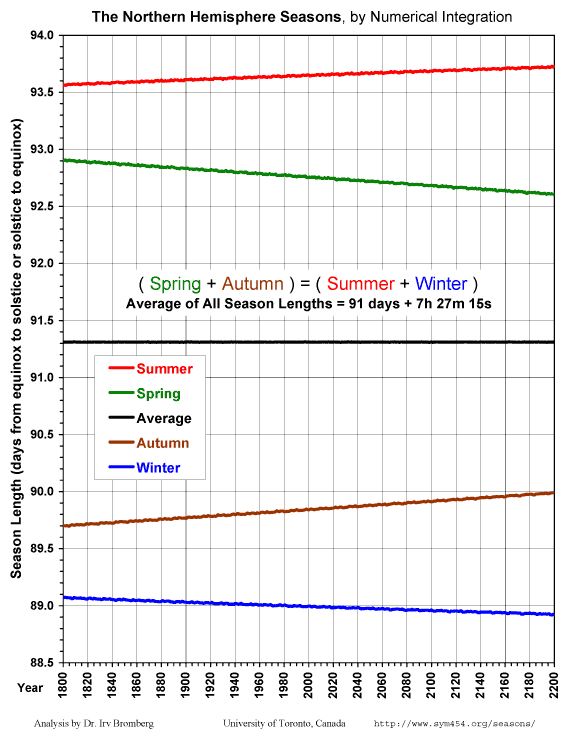 This page explains why the actual season lengths differ, and how they vary. The direction or azimuth of sunrise or sunset must be distinguished from the angle made by the path of the rising or setting Sun with respect to the horizon, known as the solar parallactic angle. Sun rises at the true east direction and sets at the true west direction on the day of an equinox, provided that the solar parallactic angle is 90°, which applies only at the equator. Click here to see charts of the variation of the direction of sunrise and sunset with latitude at the equinoxes and solstices 42KB. where all angles are in degrees (Jean Meeus, Astronomical Algorithms, second edition, chapter 14, "The Parallactic Angle", on page 99). The parallactic angle can only be 90° on days when the solar declination equals the observer's geographic latitude, which occurs twice per year for locales between the Tropic of Cancer and Tropic of Capricorn, but never occurs at latitudes further north or south of the tropics. Locales that are on the Tropic of Cancer see a 90° parallactic angle only when sunset or sunrise occurs near the moment of the north solstice, and locales that are on the Tropic of Capricorn see a 90° parallactic angle only when sunset or sunrise occurs near the moment of the south solstice. The English word "equinox" comes from the Latin for "equal night", because the duration of daytime and night time are approximately equal on the date of the equinox. At both equinoxes the daytime length is actually slightly longer than the length of night, due to atmospheric refraction making Sun appear higher at sunrise and sunset, and due to the approximately 1/2° diameter of the solar disk. Nevertheless, a properly set up sundial will show sunrise at 6 am and sunset at 6 pm on equinox days at equatorial latitudes, which explains why prior to the invention of mechanical clocks the length of day and night were believed to be equal on those days. At the north solstice the daytime length is maximal in the northern hemisphere, and minimal in the southern hemisphere, and the converse applies to the south solstice. Click here to see charts of the variation of daytime length with latitude at the equinoxes and solstices 42KB. Click here to see charts of the variation of daytime length with latitude throughout the year 133KB. This chart shows that in both the north and south hemisphere the dates of equal length daytime and nightime (where the daytime lengths cross the 12-hour line) are several days prior to the spring equinox and several days after the autumn equinox. The gaps separating the 12-hour days from the equinoxes are unequal and differ between hemispheres, because of differences in Earth's orbital velocity, and are shorter at higher latitudes (further away from the equator), because the length of day changes more rapidly near the equinoxes at latitudes further away from the equator, as shown in the chart. Click here to read a brief discussion about equal day and night lengths at the US Naval Observatory web site: <http://aa.usno.navy.mil/faq/docs/equinoxes.php>. For the traditional Chinese lunisolar calendar (and derived oriental calendars as used in Korea, Vietnam, and Japan) the seasons are reckoned relative to the solar insolation, regarding the equinoxes and solstices as the middle of their respective seasons. For non-tropical latitudes, the solar insolation determines the seasonal variations. Insolation is the amount of energy received as sunlight. The quarter of the year that receives the greatest solar insolation for a region is its insolation summer, and the summer solstice is in the middle of that season. The quarter of the year that receives the least solar insolation for a region is its astronomical winter, and the winter solstice is in the middle of that season. The other two annual quarters are the spring, between winter and summer, with the spring equinox in its middle, and the autumn, between the summer and winter, with the fall equinox in its middle. When there is ice and snow on the ground, and greatly increased cloud cover, radiative heat losses are increased due to reflection of solar radiation from the cloud tops and from the ground snow and ice. When the apparent solar altitude is low, for example during winter, less intense solar heat reaches surface locations because the rays of sunlight are spread out over a much larger area and also because they pass obtusely through a greater thickness of atmosphere, increasing the proportion that is either absorbed, scattered, or reflected by airborn dust or ice crystals. By contrast, during summer surface temperatures increase because the ground cover is often dark, absorbing solar energy more effectively, and also because sunlight shines more directly through a lesser thickness of atmosphere and its rays are minimally spread out as they more directly illuminate the surface. Surface weather patterns typically lag about 30 days or 1/3 season after the astronomical seasons, because the surface temperature depends on the balance between solar insolation and passive radiation of energy from Earth into space. Altogether, each weather season begins about (1/2 season – 1/3 season) = 1/6 season or about 1/2 month before the corresponding equinox or solstice. The remainder of this web page uses the western astronomical definitions, which regard the eqinoxes and solstices as marking the beginning of their respective seasons, but in reality the Chinese insolation seasons properly reproduce the actual astronomy. The gnomon of a sundial is the structure that casts the shadow to indicate the time of day. On a horizonally mounted sundial, if one traces on the ground the path of the end of the gnomon shadow, on all non-equinox days of the year it follows a hyperbolic curve from sunrise to sunset. The maximum curvature occurs on the days of the north solstice and south solstice. On the days of the northward equinox and southward equinox, however, the end of the gnomon shadow traces a straight line from sunrise to sunset. On an equatorial sundial with a double-faced dial mounted parallel to Earth's equator and a thin gnomon that is oriented parallel to Earth's axis and pointing directly at either the north or south celestial pole (whichever is always above the horizon at that locale), on the day of an equinox both the north-facing and the south-facing dial are equally and fully illuminated. On the day after the northward equinox only the north-facing dial will be fully illuminated, and on the day after the southward equinox only the south-facing dial will be fully illuminated. On an equatorial ring sundial with a complete circular hollow dial mounted parallel to Earth's equator and a central thin gnomon that is oriented parallel to Earth's axis and pointing directly at either the north or south celestial pole (whichever is always above the horizon at that locale), on the day of an equinox the upper half of the ring will cast its shadow onto the lower half of the ring. Due to the distance between the upper and lower half, and due to the approximately 1/2° diameter of the solar disk, the shadow of the upper half will be thinner than the width of the lower half, so the latter's hour markings will be at least partially illuminated by sunlight and the gnomon shadow will still be visible on the dial. It is practically impossible for all of the seasons to be equal in length, because Earth's orbit would have to be perfectly circular for that to be so. Earth's orbit is nearly an ellipse (see also this definition), with Sun (more precisely the solar system barycenter) at one focus of the ellipse, as per Kepler's First Law of Planetary Motion. Perihelion is that point in the elliptical orbit where Earth is closest to Sun. Aphelion is at the opposite end of the ellipse, where Earth is furthest from Sun. The mean eccentricity of the ellipse (see also eccentricity of an orbit) slowly varies as millennia pass. Variations in season lengths become more extreme as eccentricity increases, because Earth moves faster near perihelion and slower near aphelion, as per Kepler's Second Law of Planetary Motion. In addition, as eccentricity increases the perihelion distance from Sun decreases and the distance at aphelion increases, with consequent decrease in time spent near perihelion and increase in time spent near aphelion. Global mean temperatures may decrease as eccentricity increases, due to more time spent further away from Sun. The position of perihelion slowly cycles around Earth's orbit as millennia pass. This is known as the advance of perihelion, or apsidal motion. As a consequence, Earth's orbital path is not a perfect ellipse. The advance is mainly due to gravitational interactions with other planets, referred to as planetary precession. One might expect such interactions to cancel out in the long term, because they ought to be periodic and symmetrical. The motion of all of the planets in their orbits, however, makes such interactions asymmetrical over time, because the position in Earth's orbit where maximal interaction with sequentially each of the planets occurs is always further along her orbit on each pass, each planet having in the interim progressed further along its own orbit. The planets that contribute most strongly to planetary precession of Earth are Venus and Jupiter, but their gravitational interactions with Earth operate in opposite directions. Although the mass of Venus is only about 80% that of Earth, its surface gravity is about 90% that of Earth, and each time that Venus overtakes and passes Earth "on the inside track" (inferior conjunction with Earth) only about 1/4 of an astronomical unit away at intervals of about 583.9 days, it has greater angular momentum because it moves faster than Earth, so the net effect is a transfer of angular momentum from Venus to Earth. On the other hand, each time that Earth overtakes and passes opposition with Jupiter, at intervals of about 398.9 days (at its closest approach Jupiter is about 5 times further from Sun than Earth is), Earth is moving much faster than Jupiter but Jupiter's mass is almost 318 times that of Earth, so the net effect is a transfer of angular momentum from Earth to Jupiter. The intervals between closest interactions with Jupiter are just over 2/3 of the intervals between closest interactions with Venus. Gravitational and magnetic interactions with Sun may contribute to the advance of perihelion, especially when Sun "wobbles" away from the barycenter of the solar system, due mainly to the gravitational pull of Jupiter, although the other giant gas planets also "assist" when they are near heliocentric conjunction with Jupiter (from the viewpoint of the center of Sun). The intervals between Earth's passage through perihelion vary from 363 to 367 days. Such large variations can't be explained by interactions with other planets or Sun. If one considers the passages of the Earth-Moon barycenter through perihelion, however, this oscillation vanishes, and therefore it is caused by Moon. (See Jean Meeus' chapter 26, "The barycenter of the solar system" starting on page 165 and chapter 27, "On the passages of Earth in perihelion" starting on page 169 in "Mathematical Astronomy Morsels", published in 1997 by Willmann-Bell, Richmond, Virginia, USA). Nevertheless, there are long-term periodic variations in the rate of perihelion advance, which can cause successive perihelion cycles to differ in duration by several millennia! Specifically, as orbital eccentricity decreases perihelion advances more quickly, and conversely as orbital eccentricity increases perihelion advances more slowly. At the present mean rate of about 11.6 arcseconds of advancing heliocentric longitude motion relative to the distant stars (eastward) per year, perihelion takes about 111,700 years to revolve once around Sun. At the same time, however, the northward equinox is precessing at the rate of about 50.3 arcseconds of ecliptic longitude per year (retrograde, or westward) or one cycle per 25,765 years, due to Earth wobbling on its axis like a spinning top, so the net effect (50.3+11.6 = 61.9 arcseconds per year) is that perihelion advances about 1° per 59 years and therefore takes about 360° × 59 ≈ 21,240 years to revolve once relative to the northward equinox of the date, advancing through all of the seasons in sequence. Relativistic apsidal motion accounts for only about 0.3% of the heliocentric advance of Earth's perihelion, and is caused by the circumstance that in the gravitational well of Sun the curvature of spacetime causes the circumference of a circle to be less than 2πR and similarly the circumference of the orbital ellipse is reduced (actually it is the orbital radius that is disproportionately long relative to the circumference, because the plane of a planet's orbit follows the curvature of spacetime, and is most strongly curved in the region close to the mass-energy of the star). Thus Earth reaches perihelion a bit early and thus perihelion shifts with respect to an inertial frame of reference. Time runs slightly slower and spacetime is slightly more curved near perihelion. When perihelion reaches an equinox or solstice at the beginning of a season, that season and the prior season are equally short (but not minimally short), because Earth orbits fastest at perihelion, whereas in the same year the opposite two seasons are equally long (but not maximally long) because Earth orbits most slowly at aphelion. Furthermore, the equinoctial or solstitial year measured from the beginning of that season tends to be maximal in length, because Earth is moving slower at all other points in its orbit, whereas the equinoctial or solstitial year measured from the beginning of the opposite season tends to be minimal in length, because Earth is moving faster at all other points in its orbit. When perihelion is at the midpoint of any season that season has the minimum possible length for the existing orbital eccentricity, because Earth orbits fastest at perihelion, and in the same year aphelion will be at the midpoint of the opposite season, which will have the maximum possible length for the existing eccentricity, because Earth orbits most slowly at aphelion, and also in the same year the other two seasons will be equal in length at the long-term average. Four times the average season length is slightly longer than the mean solar year length measured from any point in the orbit, because precession and the advance of perihelion shorten the time that Earth takes to complete a cycle of seasons. At most only two seasons can be equal in length. When perihelion is at a mid-season point the prior and next season are equal and of median length. When perihelion is at an equinox or solstice the length of that season equals the prior season length, and the opposite season length matches its prior season length. At all other times, all seasons have unequal lengths which can differ by as much as 7 days, or even more with higher orbital eccentricity. The changing lengths of the seasons confounds any attempt to base a calendar on the assumption that they are equal in length, for it is impossible to simultaneously align all of the equinoxes and solstices with equally-spaced calendar intervals. Any method for calculation of equinox or solstice moments that makes such an assumption will typically be in error by at least several days. To evaluate the lengths of the seasons and how they change over time, and to prepare the collection of charts offered below, I used numerical integration, which is arguably the "gold standard" for celestial mechanics, and which is easy to do using SOLEX version 9.04, a free computer program written by Professor Aldo Vitagliano of the Department of Chemical Sciences at the University of Naples Federico II, Italy. The SOLEX integration was carried out in terms of Terrestrial Time (usually abbreviated TT but indicated as TDT within SOLEX), with Delta T switched off and the geographic locale set to the Equator at the Prime Meridian, starting from date January 1, 2000. SOLEX integrated forward at 3-day intervals (recommended as the optimal choice by Professor Vitagliano) to beyond the year 100,000 AD, and then starting again from year 2000 SOLEX integrated backward at 3-day intervals to before the year 100,000 BC. Starting conditions of the Jet Propulsion Laboratory DE409 ephemeris. Sun, Mercury, Venus, Earth, Moon, Mars, Ceres, Vesta, Pallas, Jupiter, Saturn, Uranus, Neptune, and Pluto. Osculating orbital elements, precession, nutation, aberration, light time. First order relativistic effects (see Special Relativity, General Relativity). For ±10000 years from the present era, SOLEX calculates precession and Earth axial tilt (obliquity) using formulas published by J. G. Williams in "Contributions to the Earth's Obliquity Rate, Precession and Nutation." Astronomical Journal 1994 Aug; 108(2): 711-724. Beyond ±10000 years from the present era, however, SOLEX estimates precession and Earth obliquity using interpolation of tabulated values published by J. Laskar, F. Joutel, and F. Boudin in "Orbital, precessional, and insolation quantities for the Earth from -20 MYR to +10 MYR". Astronomy and Astrophysics 1993 Mar; 270(1-2): 522-533. SOLEX assumes a constant J2 parameter for the Earth, so it makes no attempt to model long-term variations in Earth's oblate shape (polar : equatorial flattening) by taking into account tectonic plate movements or the mass of ice depressing the poles of the globe. SOLEX ignores planetary satellites and rings, except for our Moon. By default, SOLEX also ignores comets, asteroids, and minor planets other than those mentioned above. The user can optionally include thousands of additional objects in the integration, but doing so will slow down the analysis accordingly. For more information about SOLEX and to download the program please see its web page at <http://www.solexorb.it/>. For numerical integration solar year length charts depicting mean solar days, I multiplied the number of atomic days by the length of day, in terms of its ratio to the length of day in the year 1850 AD (it makes no graphically appreciable difference if 1900 or 1950 or even 2000 AD is chosen as the year that has a mean solar day of exactly 86400 SI seconds), based on an assumed steady tidal slowing of the Earth rotation rate such that mean solar days get longer by 1.75 atomic milliseconds per century. Of course the actual Earth rotation rate does not slow down at such a perfectly steady rate, but goes through short-term and long-term periodic fluctuations, many of which are unpredictable with our present state of knowledge. This assumed value for mean tidal slowing ought to adequately represent the difference between atomic time and mean solar time with regard to the length of the solar year. Nevertheless, tidal slowing was probably greater in the past when the polar ice caps were more massive and axial tilt was greater than in the present era, and tidal slowing will probably diminish over the coming several millennia due to global warming (reduction of polar ice mass). Several of the numerical integration charts show a secondary axis with mean Earth orbital eccentricity. That curve is based on the algorithm of Pierre Bretagnon (1984), as given by Jean Meeus in chapter 33 of More Mathematical Astronomy Morsels, "Long-period variations of the orbit of the Earth", pages 201-205, published in 2002 by Willmann-Bell, Richmond VA.
For each chart below you may click on the thumbnail image to view it as a PNG (Portable Network Graphics image) your web browser, or click on the PDF icon to view a higher-quality image of the chart using a PDF reader such as the freely available Adobe Acrobat Reader. All of the images and PDFs are well below 100 KB in size. 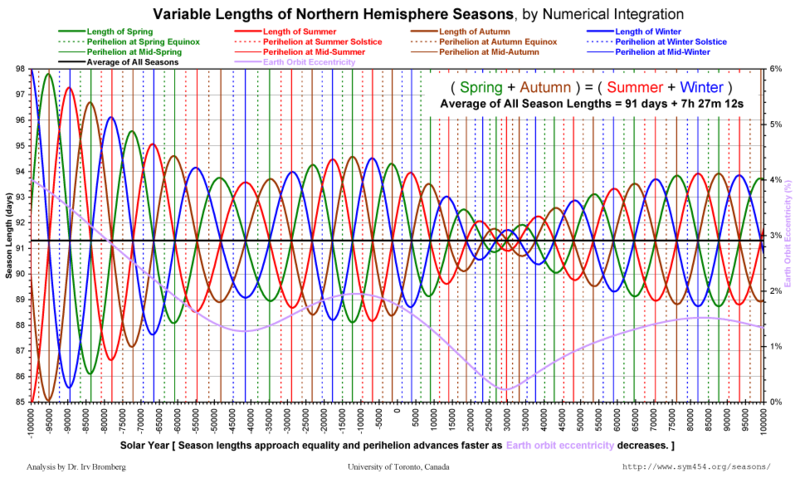 All of the following lengths of the seasons charts depict numerical integrations of the season lengths in terms of atomic days, whereas inhabitants of Earth actually experience the seasons as mean solar days. The variation in lengths of the seasons (measured in days), however, is much greater than the changing length of the mean solar day due to tidal forces (measured in milliseconds), so even if the lengths of seasons were replotted in terms of mean solar days there would not be any visually discernible differences. Nevertheless it is easy to numerically discern the long-term change. The long-term mean season length given here in terms of atomic time is 91 days 7h 27m 12s. At the assumed rate of tidal slowing (mean solar day longer by 1.75 atomic milliseconds per century) the mean solar time season in 100000 BC was about 91 days 7h 29m 55s whereas in 100000 AD the mean solar time season will be about 91 days 7h 24m 35s. 0. 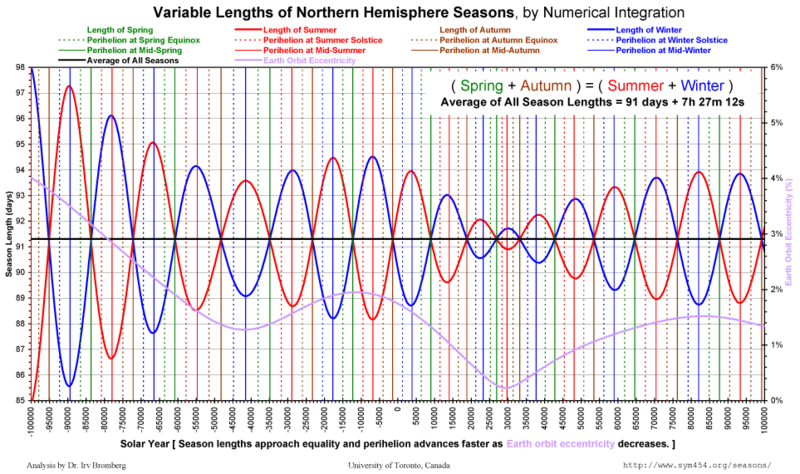 A numerical integration of the lengths of the seasons within two centuries of the present era (1800 to 2200 AD), plotted at yearly intervals without any averaging. The small wiggles in the plotted lines are not graphic artifacts, but are variations of several minutes from year-to-year caused mainly by gravitational interactions with Moon and to a lesser but non-negligible extent Venus and Jupiter. At year 2007 AD, Spring = about 92+3/4 days and getting shorter, Summer = about 93+2/3 days and getting longer, Autumn = about 89+5/6 days and getting longer, Winter = slightly less than 89 days and getting shorter, with an average season length in this data set of about 91 days 7h 27m 15s. The significance of the changing season lengths will become obvious in chart #2, next below. The Northern Hemisphere dominates global weather patterns because it contains most of the land area. With its summer being the longest season and getting longer, while winter is the shortest season and getting shorter, for the next several millennia there will be an unavoidable cumulative trend toward global warming that is being further amplified by greenhouse gases, deforestation, desertification, and heat production by human activities. 1. 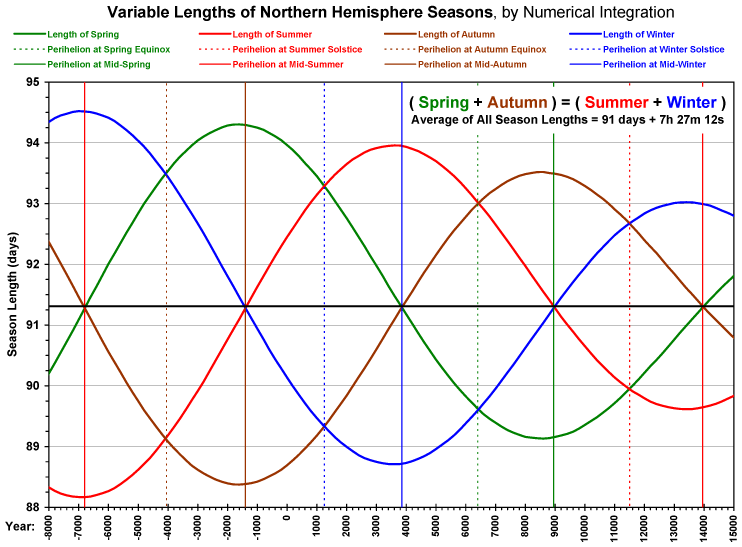 A numerical integration from 8000 BC to 15000 AD, showing the relationship between slightly more than one perihelion cycle and each of the equinoxes, solstices and seasons. Points are plotted at 200-year intervals, without any averaging, connected with straight line segments. Refer to the description above of the effect of the perihelion cycle on season lengths. In the present era perihelion is about a month ahead of mid-Winter, which it will reach around year 3850, so the length of Winter is approaching an extreme minimum and the length of Summer is approaching an extreme maximum, with correspondingly milder than usual temperatures during both seasons (for the northern hemisphere). The length of Spring will continue its past 2000 year steady decline for about another 4000 years until perihelion approaches the Spring equinox, after which the Vernal Equinoctial Year length will get shorter. Study this chart carefully, in comparison with the description above of the effect of the perihelion cycle on season lengths, otherwise the longer-term charts below won't make much sense! 2. A numerical integration from 30000 BC to 30000 AD, showing the relationship between the perihelion cycle and each of the equinoxes, solstices and seasons. Points are plotted at 200-year intervals, without any averaging, connected with straight line segments. Refer to the description above of the effect of the perihelion cycle on season lengths. In this longer-range view, spanning nearly 3 perihelion cycles, the relationship between Earth orbital eccentricity (lavender curve, secondary y-axis) and the variations of season lengths is evident. 3. A numerical integration from 100000 BC to 100000 AD of the lengths of Spring and Autumn, which are only equal when perihelion is at mid-Winter. They are, however, complementary in that their lengths always add up to one-half of the solar year (within a few minutes), so that as one gets shorter the other gets longer by the same amount. Points are plotted at 200-year intervals, without any averaging, connected with straight line segments. Refer to the description above of the effect of the perihelion cycle on season lengths. Here we can easily see that the length of the full perihelion cycle, indicated by the intervals between the color-coded vertical gridlines, varies with the mean Earth orbital eccentricity. Perihelion advances at a faster rate as the orbital eccentricity decreases. 4. A numerical integration from 100000 BC to 100000 AD of the lengths of Summer and Winter, which are only equal when perihelion is at mid-Autumn. They are, however, complementary in that their lengths always add up to one-half of the solar year (within a few minutes), so that as one gets shorter the other gets longer by the same amount. Points are plotted at 200-year intervals, without any averaging, connected with straight line segments. Refer to the description above of the effect of the perihelion cycle on season lengths. 5. 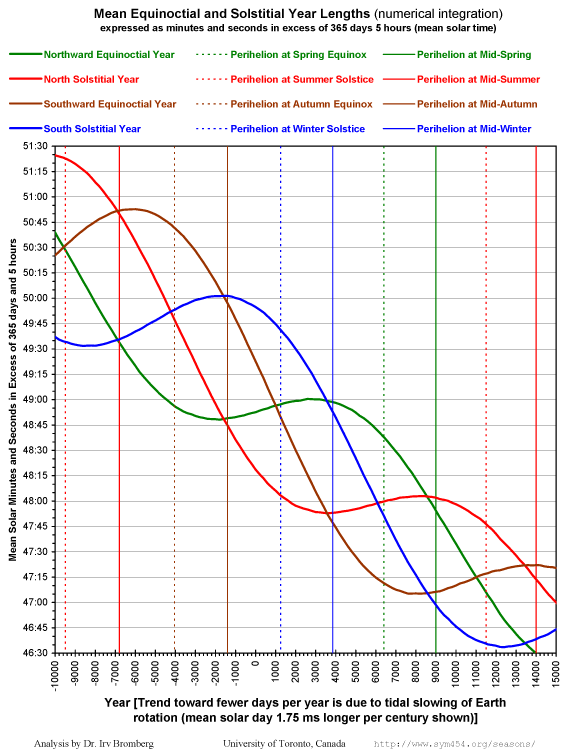 A numerical integration from 100000 BC to 100000 AD putting all four seasons together, showing season lengths varying from less than 88 days to almost 95 days. Season length variation extremes will be even greater during intervals of higher mean Earth orbital eccentricity, which occur periodically, peaking approximately every 100,000 years. The minimal variation interval near the year 50,000 corresponds to an era when Earth's orbit will be nearly circular. Points are plotted at 200-year intervals, without any averaging, connected with straight line segments. Refer to the description above of the effect of the perihelion cycle on season lengths. 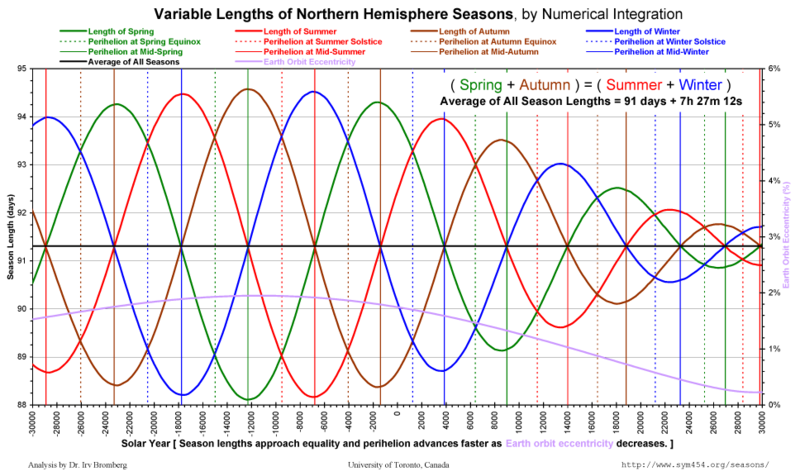 Note that when Spring and Autumn are equal at the median, Winter and Summer are at their respective minimum and maximum extremes, but when Winter and Summer are equal at the median, Spring and Autumn are at their respective minimum and maximum extremes, as per chart #2 above. 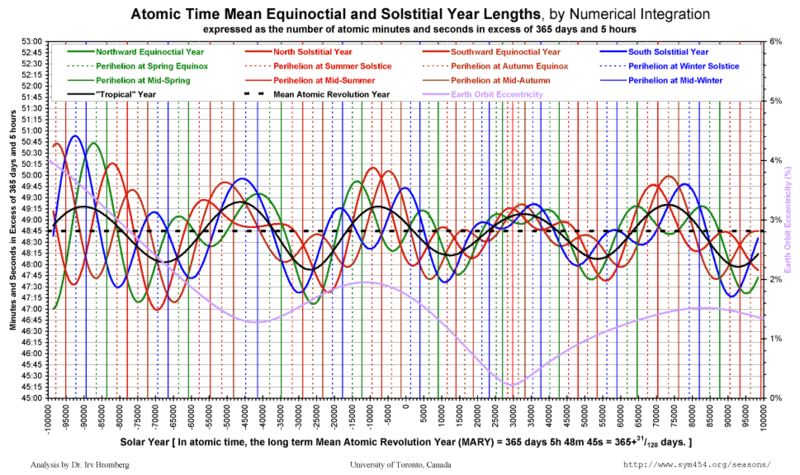 What is happening to the mean equinoctial and solstitial year lengths as the lengths of the seasons change? The dominant overall trend is towards fewer days per year (in terms of mean solar days), caused by tidal slowing of Earth's rotation. In terms of the fixed time units of International Atomic Time, however, the average time that Earth takes to orbit Sun is almost constant (see chart #9, below). As the Earth rotation rate slows the mean solar day gets longer (here a steady rate of +1.75 milliseconds per century is assumed), therefore fewer calendar days fit into that constant orbital year length. Around the time when aphelion reaches an equinox or solstice, its progressively shortening equinoctial or solstitial year length reverses its trend and may enter an era of relative stability lasting up to ten millennia, until around the time that perihelion reaches that equinox or solstice. During such an era of stability, simple fixed arithmetic leap cycle calendars can maintain good alignment with that equinox or solstice. Other points in the solar year also have stable year lengths, or "calendar seasons", such that a simple fixed arithmetic leap cycle can maintain good alignment with a particular ecliptic solar longitude. Click here for more information about stable calendar seasons. Over long spans of tens of millennia, however, there are relatively few eras when suitably stable mean solar time equinoctial or solstitial year lengths were or will be available to use with simple arithmetic calendars having fixed leap cycles. 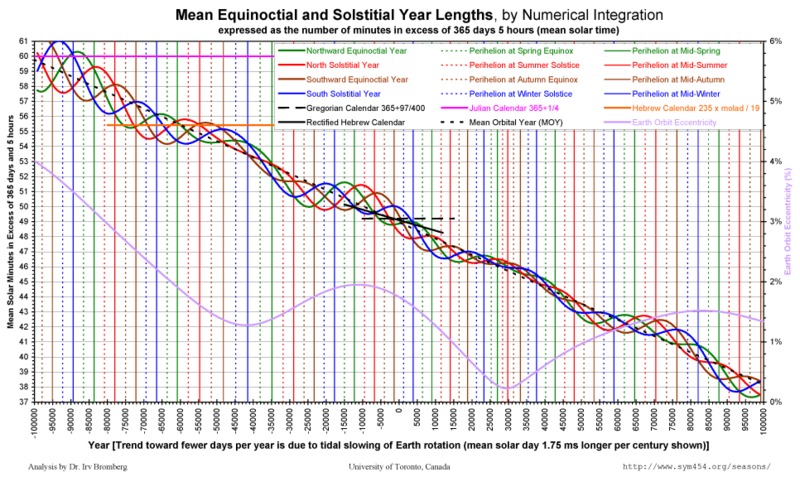 A numerical integration from 10000 BC to 15000 AD of the lengths of the mean solar equinoctial and solstitial years. Points are plotted at 200-year intervals, as the average of 1600 years before and after each point, connected with straight line segments. The northward equinoctial year (from one March equinox to the next) began such a stable era around 5000 BC and it will continue until around 6000 AD, which explains why so many cultures have fixed their calendars relative to that equinox. However, all calendars that employ fixed arithmetic leap cycles will see the northward equinox drift to earlier dates at an accelerating rate when the northward equinoctial year resumes its trend towards shorter year lengths after the year 6000 AD, except for the Rectified Hebrew Calendar (depicted as a diagonal solid black line on the chart "With Calendars"), which steadily shortens its mean year by about 4+1/6 seconds per millennium (due to its progressively shorter molad interval) and will thereby "hold on" to the equinox for an extra 3 millennia. The north solstitial year began an era of stability shortly before the beginning of the present millennium (before 2000 AD), and it will continue to have a nearly constant year length until around 11500 AD. We are now in the First Millennium of the New Age of the North Solstice! From the year 2000 through to the end of the New Age, a fixed calendar arithmetic cycle of 365+94/389 or about 365.24165 days closely approximates the mean solar north solstitial year length, so a fixed arithmetic calendar that has 94 leap days or 69 leap weeks per repeating 389-year cycle will nicely parallel the north solstice for the next ten millennia, as shown in the chart. Norsemen of the 11th century apparently used a leap week calendar intended to align with their summer solstice — this chart shows that by that era the astronomical solstitial year length was just entering its present period of long-term stability, due to the approach of aphelion to that solstice. A lunisolar (leap month) calendar could maintain excellent alignment relative to this solstice using a 296-year cycle with 109 leap years and a total of 3661 months per cycle. The Chinese align their lunisolar calendar relative to the south solstice (December or winter solstice), which could have been used with a fixed arithmetic leap cycle having a mean year of approximately 365.2429 days from before 8000 BC until around 1000 AD, although it seems that they always chose considerably longer mean calendar years, probably for better correspondence with the metonic 19-year cycle of 235 lunar months. Since around 1000 AD the south solstitial year length has been getting shorter too rapidly for use with any fixed leap cycle, and currently is best tracked by astronomical calculations, as is the contemporary Chinese practice, although a Linear Approximation progressive leap rule could do nearly as well using much simpler arithmetic. From around 5000 BC until about 6000 AD the southward equinoctial year length (from one September equinox to the next) changes too rapidly for an arithmetic calendar based on any fixed leap cycle. No doubt this frustrated the French when they attempted to align the French Revolutionary Calendar with respect to that equinox! A Linear Approximation progressive leap rule could nicely match the southward equinox using quite simple arithmetic. 7. A numerical integration from 50000 BC to 50000 AD of the lengths of the mean solar equinoctial and solstial years. The trend towards fewer mean solar days per year is very evident. Points are plotted at 200-year intervals, as the average of 1000 years before and after each point, connected with straight line segments. The equinoctial or solstitial year lengths change progressively during eras when the mean Earth orbital eccentricity is either very high or is changing rapidly (the rate of advance of perihelion varies), associated with large reverse swings when aphelion reaches the beginning of each season. Around the year 30000 AD, when Earth's orbit will be nearly circular (where the mean Earth orbital eccentricity curve reaches its minimum within this range of years), all of the mean solar year lengths will be nearly equal and will get shorter in parallel to each other, too rapidly for any fixed arithmetic calendar cycle. 8. A numerical integration from 100000 BC to 100000 AD of the lengths of the mean solar equinoctial and solstial years. Points are plotted at 200-year intervals, as the average of 1000 years before and after each point, connected with straight line segments. The trend towards shorter years now looks quite tight. Note how well the Mean Orbital Year (MOY) seems to track the long-term trend towards shorter year lengths. The MOY line shown on these charts is not a statistical regression line — it is based on adopting a daily rate of increase in solar longitude at the Symmetry454 / ISO / Gregorian calendars epoch of 0.9856469813365 degrees per mean solar day and a constant rate of change equal to 5.55894094157348 × 10-13 degrees per mean solar day per mean solar day (these are not necessarily golden numbers, they are simply the coefficients that were actually used for the calculation as plotted). Evidently the Traditional Hebrew Calendar mean year is far too long for the present era, but it would have been ideal for 75000 BC to 55000 BC, which was eons before the traditional year of Creation! In that era, however, it was the mean North Solstitial year that was stable and closest to the mean year length of the Traditional Hebrew Calendar. Note how much longer the mean year of the Traditional Hebrew Calendar is in comparison with the Rectified Hebrew Calendar. Up near the very top of the graph is the Julian Calendar, whose mean year of exactly 365 days 6 hours was too long even for the year 100000 BC! 9. Like chart #8 above, but this numerical integration from 100000 BC to 100000 AD depicts the equinoctial and solstitial year lengths in terms of atomic days, as used for celestial mechanics calculations, rather than the mean solar days that were shown above. 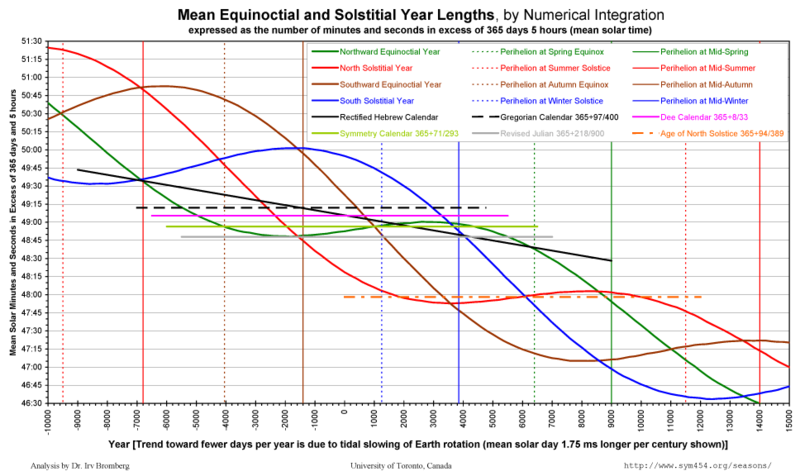 Thus it shows the periodic changes in equinoctial and solstitial year lengths that are due to the advance of perihelion, but it doesn't show any trend towards shorter mean years, because the average number of atomic days per year is essentially constant. Points are plotted at 200-year intervals, as the average of 1600 years before and after each point, connected with straight line segments. 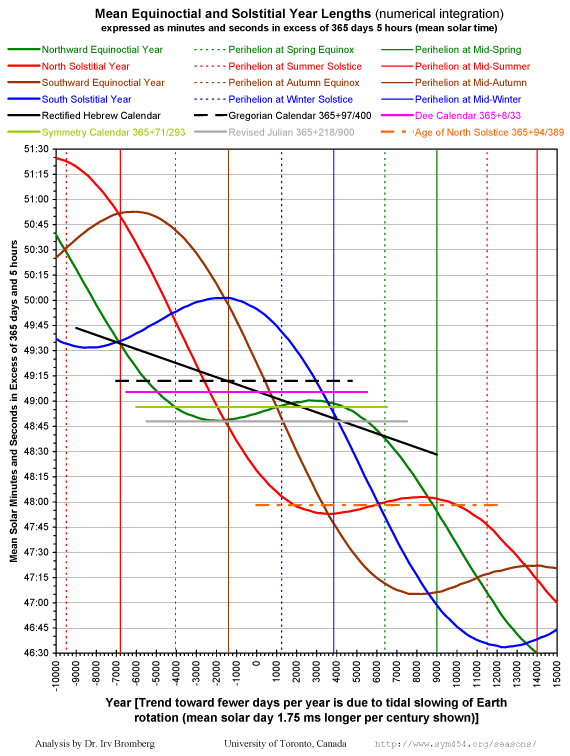 The Mean Atomic Revolution Year (MARY) line shown on this chart is not a statistical regression line. In terms of atomic time, MARY has a permanently fixed year length of exactly 365 days plus 5 hours 48 minutes and 45 seconds ≡ 365.2421875 days ≡ 365+31/128 days. This is exactly 675 atomic seconds ≡ 11 minutes and 15 seconds ≡ 1/128 day shorter than a Julian Year of 365+1/4 atomic days. In a vacuum light travels at the rate of exactly 299,792,458 metres per atomic second (this defines the length of the metre). Conventionally a Light Year is the distance that light travels during one Julian Year ≡ 9,460,730,472,580,800 metres. The distance that light travels in one MARY is shorter by 675 light-seconds ≡ 675 seconds × 299,792,458 metres per second ≡ 202,359,909,150 metres, so the Mean Atomic Revolution Light Year (MARLY) ≡ 9,460,528,112,671,650 metres. 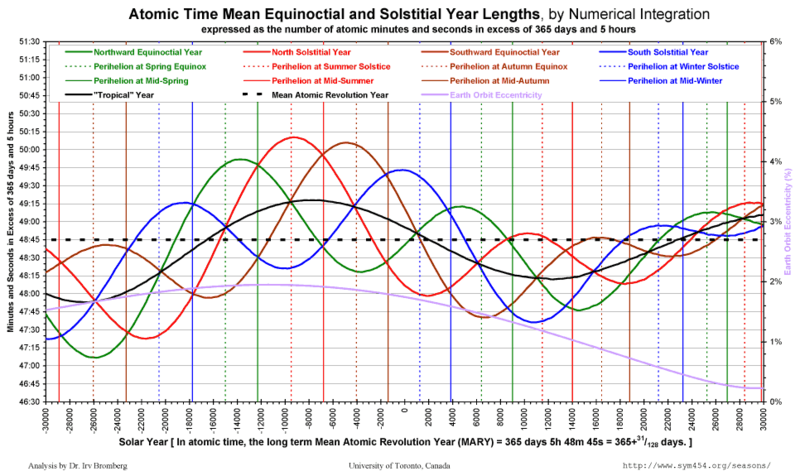 The astronomical "Tropical" Year, valid only in terms of atomic days, is also plotted, calculated as the average of the equinoctial and solstitial year lengths. This Tropical Year calculation is as specified by Jean Meeus in "NOTE 4" at the bottom of page 365 of chapter 63, "Gregorian Calendar and Tropical Year", in More Mathematical Astronomy Morsels, published by Willmann-Bell Inc. in 2002). The nearly sinusoidal variation of the Tropical Year is due to Earth's axial tilt (obliquity) cycle, which varies between about 22.1° and 24.5° over a 41000-year period. These variations are both caused by and stabilized by the monthly interactions between Moon and Earth's oblate spheroid form with equatorial bulge. Due to the approximately 5° obliquity of the lunar orbit, Moon alternately passes north of and then south of Earth's equatorial bulge during every lunar cycle, causing Earth's axis to alternately nod northward and then southward. This interaction is slightly asymmetrical, so over many millennia it causes a slow progressive change in axial tilt that reverses at the minimum or maximum. Reference: Laskar J, Joutel F, Robutel P. "Stabilization of the Earth's obliquity by the Moon" Nature 1993 Feb 18; 361:615-7. 10. Like chart #9 above, this numerical integration from 30000 BC to 30000 AD also depicts the equinoctial and solstitial year lengths in terms of atomic days, but provides a closer look for years near the present era. Points are plotted at 200-year intervals, as the average of 1600 years before and after each point, connected with straight line segments. This chart is similar to row #9, above, but without the equinoctial and solstitial year length curves, leaving only the Tropical Year, to which I fitted a cyclic approximation. Points are plotted at 200-year intervals, as the average of 1600 years before and after each point, connected with straight line segments. where MARY as above is 365+31/128 atomic days, and 33/86400 of a day is simply the 33-second amplitude of each half-cycle (reducible to 11/28800). The operand to the cosine function is in terms of radians, so there are 6400 years per radian and therefore 6400 π ≈ 20107 years per half-cycle, which is equal to the mean duration of the perihelion cycle. 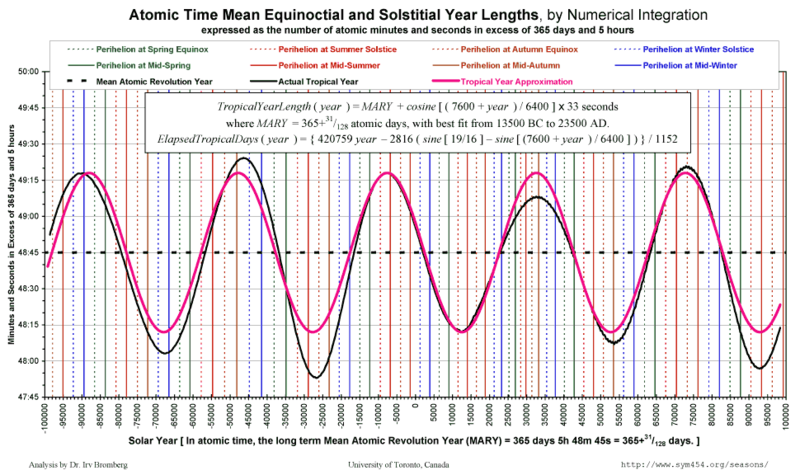 Averaging the solar year lengths over 21200-year intervals leaves a residual sinusoidal wave having a 41000-year period and more than ±15-second variation amplitude (click here to see chart 48KB, in PDF format only), due to Earth's axial tilt cycle, whereas averaging over 41000-year intervals yields nearly flat lines (see chart 12, below). If desired, a non-integer year value can be passed as a "Tropical Date", to include in the integration the number of days up to that fraction of an elapsed Tropical year. To use this elapsed day count for a calendar leap cycle, simply subtract Delta T to convert to mean solar days. 12. Given that the Tropical Year approximation cycle length matches the periodic variations of the Earth axial tilt (obliquity), averaging the solar year lengths over intervals of 41000 years would be expected to almost entirely average out the largest amplitude long-term cycle, confirmed in this chart, in which the points are plotted at 200-year intervals as the average of 20500 years before and after each point, connected with straight line segments. On quick inspection, the Tropical Year average from 0 BC to beyond 10000 AD is a flat line at about 4/5 second shorter than MARY's 365+31/128 days, or 365+104621/432000 atomic days ≈ 365+5231/21600 atomic days (rounded down to the nearest second) = 365d 5h 48m 44s. Although other relatively simple fractions that are closer include 209/863 and 178/735, it seems sufficient to retain the simpler 31/128 fraction for MARY. The Mean Atomic Revolution Century (MARC) is 100 × 365+31/128 days ≡ 36524+7/32 days ≡ 36524 days 5 hours and 15 minutes. The Mean Atomic Revolution Millennium (MARM) is 10 times longer ≡ 365242+3/16 days ≡ 365242 days 4 hours and 30 minutes. MARY, MARC and MARM have the advantage of negligible long-term average seasonal drift, whereas the Julian Year, Julian Century and Julian Millennium that are conventionally employed in atomic time astronomical calculations drift through the seasons at the average rate of about 1/4 – 31/128 = 1/128 of an atomic day per Julian year or one full day per 128 atomic years. The Persian Calendar and the Indian National Calendar attempt to partially account for varying season lengths by having longer months clustered near aphelion and shorter months clustered near perihelion. The Persian Calendar begins each year at the northward equinox, observationally determined at Tehran. The first six months (spring and summer) are 31 days each, the next five have 30 days (autumn and 2/3 of winter), and the last month has 29 days, or 30 days in leap years (last month of winter). The Indian National Calendar starts the year on Gregorian March 22nd (March 21st in leap years) with a 30-day month (31 days in leap years), then has 5 months of 31 days followed by 6 months of 30 days. The date of perihelion is currently less than 2 weeks after the south solstice, and although it will drift progressively later in the solar year neither calendar has a defined process for adjusting month lengths to track it. Shriramana Sharma of India proposed a calendar reform based on the Indian National Calendar, which he calls STAY (Simplified Tropical Astronomical Year) and which progressively adjusts its month lengths as aphelion advances. There is a limit to how far this concept can can be rigorously implemented, however, because aphelion can vary up to 1/2 month away the middle of the period that contains the 6 longer months, and because the differences in length between the shorter and longer seasons will progressively diminish over the coming few tens of millennia, as charted above (see charts 6,7,8). Therefore the STAY calendar arithmetic is simplified by tracking the uniform motion of the mean aphelion of the Earth-Moon barycenter, rather than calculating when Earth itself is furthest from Sun. As mentioned near the top of this page, I have taken an estimate of the changing Earth rotation rate into account by using a parabola to approximate Delta T, based on the assumption that solar days will get 1.75 milliseconds longer each century (for more information about Delta T see this page). Relative to other approximations that have been proposed for Delta T, this assumed rate is about average. What if Earth's rotation rate changes more slowly than that approximation predicts? What if Earth's rotation slows down more than predicted? We should take into consideration the uncertainty of changes in the Earth rotation rate. Today the Earth rotation rate and rotation angle are monitored internationally on a daily basis, primarily using Very Long Baseline Interferometry (VLBI) of distant quasars. This technique is so sensitive that it can detect irregular daily fluctuations in Earth rotation caused by the weather! For the purpose of predicting long-term calendar drift, however, we don't care about any irregular or periodic variations in the Earth rotation rate, whether they have short, medium-or long periods, because all periodic variations will average out over the long-term. Instead, we care about the dominant long-term progressive slowing of the Earth rotation rate that is due to tidal forces, primarily gravitational interactions with Moon, which continually transfer angular momentum from Earth to Moon. What really matters to calenders is the mean Delta T at any point in the past or future. To visualize the range of uncertainty of Delta T with respect to calendars, I generated plots of the mean equinoctial and solstitial year lengths similar to those presented above, but for each equinox and solstice I added four curves to outline the Delta T uncertainty. The main curve, plotted with the thickest colored line, is the mean year length using my standard Delta T approximation. Other plotted curves show the mean years that would be obtained if Delta T is 50% less, 25% less, 25% more and 50% more than my standard approximation. The thick black curve shows for comparison the varying length of the equinoctial or solstitial year in terms of atomic time (Delta T always equal to zero), as per chart #9, above. 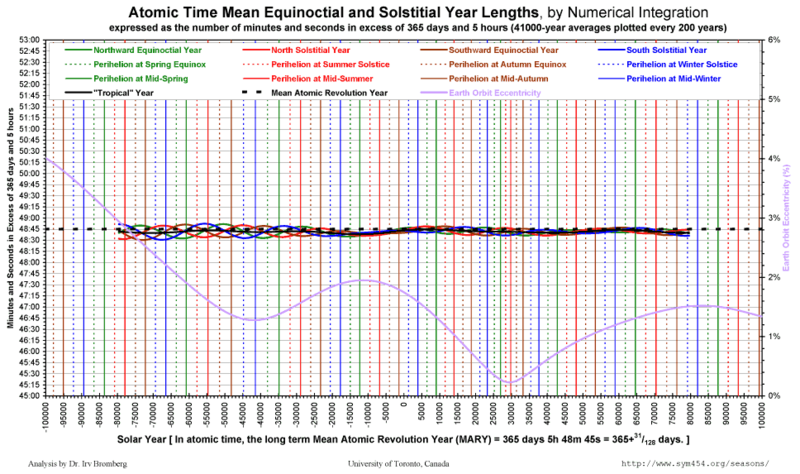 Click here for charts of the effect of varying Delta T on mean equinoctial and solstitial year lengths 187KB. Nobody knows how much Delta T will actually vary in the future, because it has only been accurately tracked since the advent of atomic time systems, and very good accuracy has only been obtained since the advent of very long baseline interferometry of distant quasars. Furthermore theoretical models of the non-rigid Earth and the Earth rotation rate do not yet accurately account for past recorded or present observed variations. The ±25% curves encompass the range of Delta T approximations that various publications have proposed. I have added the ±50% curves just to encompass the "wild unknown". Regardless of what the long-term Delta T rate turns out to be, the long-term charts presented in the table above remain instructive with respect to the periodic stepwise cycling of the equinoctial and solstitial year lengths and the lengths of the seasons. It is clear that there is a fairly steady long-term trend towards fewer mean solar days per solar year, but the overall slope of the lines plotting equinoctial or solstitial mean years against elapsed years will differ according to what the actual Delta T rate turns out to be. 13. 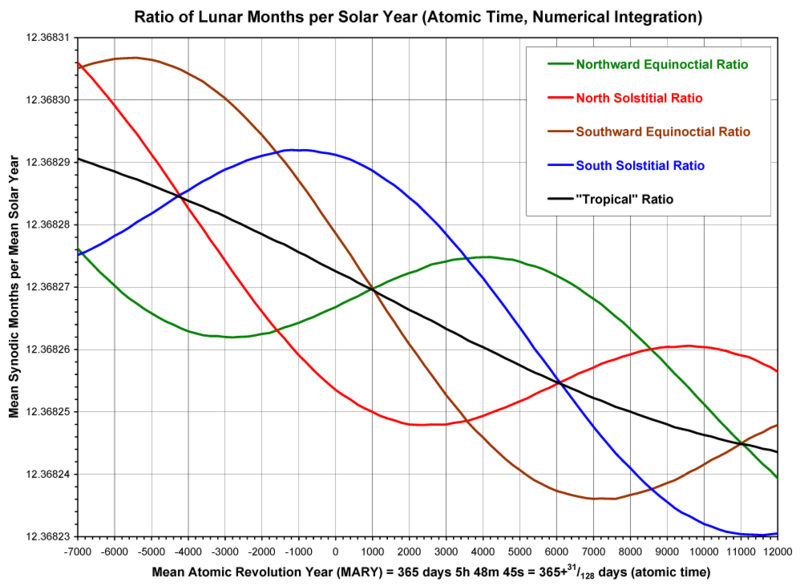 This chart plots the ratios of the atomic time lengths of the mean equinoctial and solstial and tropical years to the atomic time mean synodic month (mean length of the lunar cycle from lunar conjunction to lunar conjunction), based on numerical integration data generated by SOLEX. 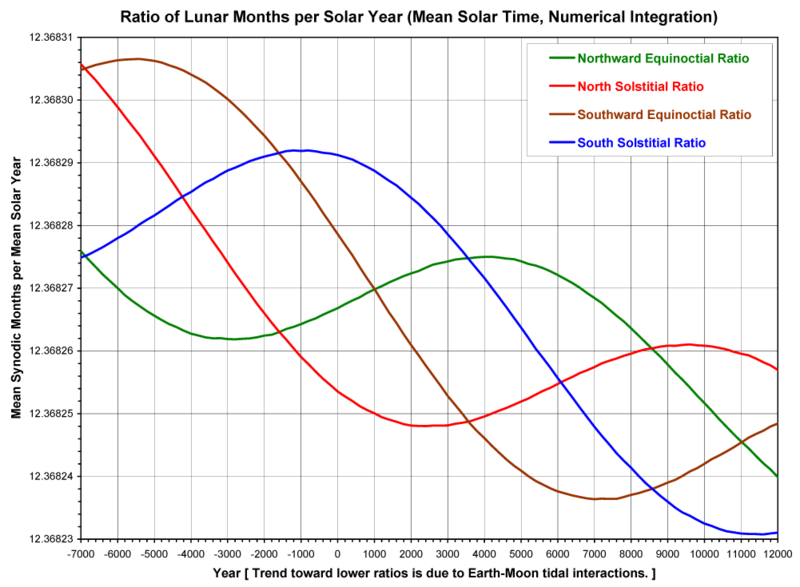 For details on the mean lunar cycle calculations see the "Length of the Lunar Cycle" web page at <http://www.sym454.org/lunar/>. 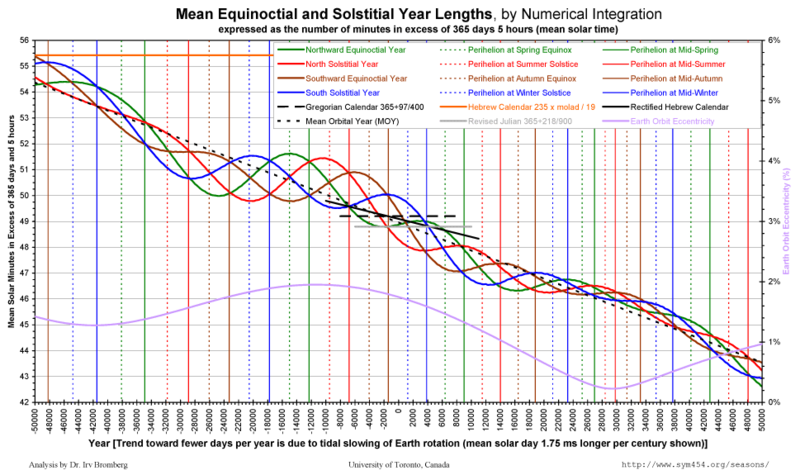 All of the equinoctial and solstitial ratio curves show periodic variations, with long term trends toward lower ratios. As I have shown above, over the long term the length of the mean atomic revolution year (MARY) is essentially constant, so the trends toward lower ratios are due to the progressively longer lunar revolution period, as Earth-Moon tidal interactions cast Moon progressively further away from Earth. The shorter term periodic variations are cancelled out in the "Tropical" ratio curve, leaving a residual gentle curvature that is due to the Earth axial tilt cycle. 14. This chart plots the ratios of the mean solar time lengths of the mean equinoctial and solstial years to the mean solar time mean synodic month, based on the same numerical integration data generated for the chart above by SOLEX, but with Delta T subtracted to convert atomic time (Terrestrial Time) to mean solar time (Universal Time). For details on the Delta T polynomial approximation employed see the "Delta T" entry under the heading "Glossary of Terms" on the "Length of the Lunar Cycle" web page at <http://www.sym454.org/lunar/>. All of the curves are essentially superimposable upon the corresponding curves of the atomic time chart above, because the rate of change of the length of the mean solar day affects the length of the mean solar year and the mean synodic month in equal proportions, and cancels out. The slight differences seen when the two charts are superimposed are present only because I generated them from separate Excel files and it is technically difficult to exactly match chart dimensions in Excel. Although the variation of the northward equinoctial ratio near the present era and for about 4 millennia into the future shows only modest variation and could be approximated with a fixed ratio, it is easy to obtain superior and longer duration fits directly to the mean northward equinoctial year using simple fixed leap cycles (see the "Solar Calendar Leap Rules" web page at <http://www.sym454.org/leap/>). The north solstitial ratio is only briefly stable near the present era, whereas it is easy to fit a simple fixed arithmetic leap cycle directly to the mean north solstitial year that will approximate it quite well for the next 10 millennia, as discussed above for chart #6. 15. Same as chart #14 above, but with the layout changed to depict some well-known leap month calendar cycles. The portrait orientation and expansion of the y-axis scale to higher ratios were necessary for inclusion of the Metonic 19-year cycle (orange dashed line at the top of the chart), which has a disproportionately high ratio of months to years. The 334-year cycle (deep pink dashed line) has a ratio that is much lower than the northward equinoctial ratio in the present era. It is not possible to reliably assess the astronomical accuracy of a leap month cycle merely by examining the the fit of the months per year ratio. For example, the 353-year cycle used for the Rectified Hebrew Calendar (black dashed line) will provide an excellent fit to the northward equinoctial ratio for the next 5 millennia. If the 353-year cycle is used with the slightly too long traditional fixed molad interval then it will be able to parallel the northward equinox very well for the next 4 millennia, but if it is instead used with a progressively shorter molad interval then even though the ratio will be identical it will be able to hold onto the northward equinox for an additional 3 millennia, for a total of 7 millennia from the present era. In the Traditional and the Rectified Hebrew calendars, the length of the molad interval, taken together with the leap month cycle, sets the calendar mean year. Although it appears that the ratio of the 296-year cycle (light orange dashed line near the bottom of the chart) is too low compared to the north solstitial ratio that it is intended for use with, it can still be used for a very accurate leap month calendar that will parallel the mean north solstice, provided that the calendar mean year depends only on the leap month cycle, independently of the molad interval (which will only determine when months start).